The reasons of the Indian National Lok Dal’s worst-ever debacle in the recent parliamentary poll, as described by Sampat Singh, a senior leader of the party, have created a flutter within the party and INLD workers have been discussing these reasons with interest throughout the state. The silent revolution of Mewat seems to have created ripples in the country’s topmost scientific circles as well. The outcome: The Indian Institute of Technology (IIT), New Delhi, has mooted a proposal to adopt seven villages of the area to give a scientific perspective to cattle rearing. In view of an objection raised by the Audit Department, the Maharshi Dayanand University (MDU) authorities have fixed the age limit for appointment to various posts in the university. The Haryana government today ordered and transferred 29 IPS officers with immediate effect. The government also issued transfer orders of five Superintendent of Police. VB Singh is the new DG (State Vigilance Bureau); Brijinder Rai becomes DG (OSD) rules; Swaranjit Singh goes as DG (Administration); Rakesh Malik has been posed as DG (Human Rights and Litigation) and VN Rai will be the new DG (Law and Order) with additional charge of HPA. “A missing man, a floating body and police inaction” has led the Punjab and Haryana High Court to virtually pass strictures on the investigating agency, and acquit all accused. It was an atmosphere of eeriness and sombreness at the residence of Flt Lt Varun Kumar as the long wait for shocked family members ended with the arrival of his body here this afternoon. Mystery shrouds the murder of a young girl and serious injuries to a youth, said to be her lover, in Bhodia Khera village near here last night. A joint team of the IG staff from Hisar and the local police last night raided a house in Lohia Basti in the Kirti Nagar area of Sirsa town and arrested three cricket bookies over “betting” deals on the Twenty-20 tournament being played between India and the West Indies in England at that time. Sampat Singh has cited as many as 65 reasons for the defeat of the INLD and sent these to the party. Captioned as “Summary of the questions raised by party workers during party meetings”, Sampat Singh has raised some pointed questions on the style of functioning of the party leadership, among some other factors, and has attributed the party’s debacle to these factors. Going by the sharpness of the language of his letter, through which he has enumerated the reasons for the party’s rout, Sampat Singh has left political observers speculating about his future plans. “The party claims to be following the policies of Devi Lal and has cashed in on Devi Lal’s name on several occasions, but, in fact, it is miles away from the former Deputy Prime Minister’s politics. While Devi Lal could meet and talk to any common man anywhere, the present leadership of the party remains in the company of the rich and affluent, stays at their residence and takes meals with them. The present leadership of the party does not even like to listen to the poor,” is one of the several reasons cited by Sampat Singh. Sampat Singh has also had a dig at the SMSes being solicited from workers seeking their suggestions and said workers get respect in the party till the party is out of power and their suggestions are also welcome but once the party attains power, workers are the first to be humiliated publicly. Arrogance of those who remain in close proximity to the Chautala family, the denial of the ticket to Sushil Indora and Kailasho Saini cost the party dear and lack of powers to ministers during the INLD regime have also been cited as some of the reasons for the party’s debacle. This will sure be a big shot in the arm for the Sankalpit India Parivar here, which launched this novel experiment of inspiring the Meo Muslims - natives of the area - to rear cattle. Thanks to the campaign, the Mewat area, which was once notorious for cow slaughter, is now a hub of cattle rearing. “We had a tough time convincing the people here that cattle rearing would bring them greater dividends than cow slaughter, but once the point was hammered home, there was no looking back,” maintains Mohan Singh Ahluwalia, who quit his cushy job of Commissioner (Disabilities), Haryana, and got engaged in the movement since then. Ahluwalia’s presentation at a recent seminar at the IIT caught the attention of Dr R Chidambaram, Principal Scientific Advisor to the Prime Minister. Dr Chidambaram was so impressed by the case study that he directed a team of scientists from the IIT to visit Mewat to have a firsthand feel. Following this, a 20-member team, led by Dr Rajendra Prasad, head of the Rural Science and Technology Department at the IIT, recently toured nearly a dozen villages of Mewat during their two-day visit to the area. The team identified Malab villages of Nuh district to be adopted by the IIT for provision of better facilities for cattle rearing. According to sources, six more villages would subsequently be adopted by the IIT for the purpose. Dr Prasad maintained that ponds would be dug and trees planted around these in the villages in which cattle were being reared in large numbers. Following the Kurukshetra University rules, the maximum age limit for entering various services of MDU has been fixed at 50 years.This could be relaxed in special cases by the authorities. A decision to this effect was taken at an Executive Council meeting of the university held here today. A proposal was cleared for the introduction of new courses, MBA (2 years), MCA, MCom (5-year) integrated course, MA (geography) and PG diploma in retail management at the PG Regional Centre, Rewari, besides Bachelor of Tourism Management (BTM) at the Institute of Hotel & Tourism Management and MTech (software engineering) at the University Institute of Engineering & Technology. PV Rathee becomes DG (CID); Anil Dawra has been posted as ADGP (CID); Parminder Rai is the new ADGP (SVB); YP Singal will be the new ADGP (CID); Mohinder Lal goes as ADGP (Crime) and Shriniwas Vashisht has been posted as ADGP (Armed Police). Dr RC Mishra is the new IG (Prisons); RC Jowel goes as IG (Vigilance); Manjit Singh Ahlawat becomes IG (Vigilance), Gurgaon; Shiv Shakti Rao has been posted as IG (CM flying squad) and Dr KP Singh goes as IG (Training and OSD Rules). K Selvaraj will hold additional charge of IG (Telecommunication); Dr Rajwant Singh will be the new IG (Law and Order); Sudhir Chowdhary goes as IG (HPA) Madhuban; PK Aggarwal has been posted as IG (Faridabad range) and Alok Mittal promoted as Jt Commissioner of Police, Gurgaon. AS Chawla is the new DIG (CID); Raj Pal Singh becomes DIG (Law and Order) and PS Ranga will be the new DIG (IRB) Bhondsi. The five new SPs are Navdeep Singh Virk (Hisar); Shrikant Jadhav (Panipat); Anil Kumar Rao (Rohtak); Mohinder Singh Sheoran (Sonepat) and KK Rao (Karnal). Taking up an appeal filed by Ajit Singh and others, Justice KS Garewal and Justice Nawab Singh also ruled the “prosecution miserably failed to connect the accused with the crime” investigated by the police in Jind district. A case of adduction and common intention was registered on September 26, 2002, after 25-year-old Vijender disappeared from his house about 10 days ago. Unknown to the police, Vijender’s body was found floating in the Rajli Canal in Hisar district on September 20, 2002. The body’s photograph was shown to Vijender’s father Raj Kumar after five months, who identified it. Subsequently, Vijender’s mother-in-law Om Pati and others were sentenced to life by a Jind court. Reversing the order, the Bench observed: There is no connection between the missing man and the accused. The prosecution failed to examine Ram Kumar (a fellow villager), who had called father Raj Kumar to tell him two persons were standing in the street, asking for Vijender. “The prosecution also failed to examine Raj Kumar’s wife Rajbala, the person who allegedly saw her son Vijender being forcibly taken away in a Maruti on the night of September 15.... The links in the prosecution chain are weak and incomplete”. “Vijender disappeared on September 15. His dead body was found floating in a canal in the neighbouring district on September 20. Vijender’s disappearance was reported to the police on September 23. What did the investigator of Uchana do after September 23? The police should have flashed messages across Haryana and neighbouring states regarding Vijender’s disappearance. “The investigator should have checked up hospital records to find Vijender. If the investigator had been astute, he would have discovered within a few days a body had been found in a canal on September 20.... This would have helped the police to trace the missing Vijender and investigate if there was afoul play. But nothing of the sort happened”. His home was crowded as relatives, friends and associates poured in to express their condolences as the coffin, covered in the Tricolour and accompanied by five Air Force officers and 15 Army jawans, arrived. His parents had never thought even in their wildest dreams that the promising career of their son, who celebrated his 24th birthday on May 24 last, would end up abruptly and he would return in a coffin. 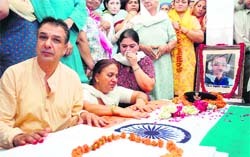 Family members, friends and relatives paid floral tributes to the departed soul. The funeral procession started from his residence in Defence Colony to the Bankhandi cremation ground. His photograph garlanded with flowers was placed over the coffin. His mother was inconsolable. Flt Lt Varun Kumar was accorded a guard of honour by an Army guard called from Hisar. Army jawans fired into the air as his father, Prof Jai Dev, lit the pyre and grief-stricken family members and friends bid adieu to beloved son of the soil. Indian Air Force’s Antonov-32 aircraft, co-piloted by Flt Lt Varun Kumar, had disappeared in the snow-capped mountains of Arunachal Pradesh on Tuesday and later it was confirmed that the plane had crashed and all 13 persons on board had been killed. The wreckage of the IAF plane was spotted by a search team at over 12,000 ft in the far-flung West Siang district, 24 hours after it crashed and the bodies were recovered. A loveable pilot, caring son and keen sportsman, Flt Lt Varun Kumar had dreams of flying aircraft and he left a career in engineering to fulfil his dream, but unfortunately died while living his dream. His father, Prof Jai Dev, was heartbroken but had the consolation that his son had sacrificed his life for the country. Flt Lt Varun Kumar had marriage on his mind. He had chosen a girl for himself and had called up his parents a day before the crash, seeking their approval. His parents had no objection. The only child of his parents, Flt Lt Varun had rung up his mother in Jind, a night before the crash to say that he was missing her. He wanted his parents to take the first flight to Jorhat in Assam, his base. The victim, Geeta (19), a Dalit, was to get married on June 28 and according to her younger sister Suman, the youth, Rajesh (22), killed her sister before stabbing himself. “Geeta and I had gone towards the fields in the village when Rajesh stopped her and asked her to elope with him. When she refused, Rajesh attacked her with a big scissor,” Suman alleged in her statement to the police. Suman, who has also received injuries on her hand, said Rajesh was furious at her sister marrying someone else and while stabbing her in the stomach, he said that if she could not marry him, he would not allow her to marry anyone else too. Later, Rajesh stabbed himself, she told the police. Parkash Chand, SHO of the city police station, Fatehabad, said Rajesh stabbed Geeta’ five times in her belly and then stabbed himself four times. Rajesh is still lying unconscious in the hospital, while his kin maintain that it is a case of honour killing. “Someone attacked both with a sharp-edged weapon and then threw them on the outskirts of the village, presuming both to be dead,” alleged Zile Singh, a maternal uncle of Rajesh. Meanwhile, the police is waiting for Rajesh to regain consciousness so that he can throw light on the episode. A spokesman of the district police said the police recovered Rs 15,800 in cash, eight mobile phones, six mobile chargers and a colour television set from their possession.